Sunrise, 1873. Oil on canvas by Claude Monet. Impressionist art is a style of painting that emerged in the mid-to-late 1800s and emphasizes an artist's immediate impression of a moment or scene, usually communicated through the use of light and its reflection, short brushstrokes, and separation of colors. Impressionist painters,such as Claude Monet in his "Impression: Sunrise" and Edgar Degas in "Ballet Class," often used modern life as their subject matter and painted quickly and freely, capturing light and movement in a way that had not been tried before. Impressionism is a style of painting that was developed in the late 19th century. The style, methods, and topics of Impressionism rejected previous "historical" painting, replacing carefully hidden brushstrokes of historical events with visible thick bright colors of modern scenes. The first exhibition was in 1874, and it was roundly panned by art critics. Key painters include Edgar Degas, Claude Monet, Berthe Morisot, Camille Pissarro, and Pierre-Auguste Renoir. Although some of the most respected artists of the Western canon were part of the Impressionist movement, the term "impressionist" was originally intended as a derogatory term, used by art critics who were flatly appalled at this new style of painting. In the mid-1800s, when the Impressionist movement was born, it was commonly accepted that "serious" artists blended their colors and minimized the appearance of brushstrokes to produce the "licked" surface preferred by the academic masters. Impressionism, in contrast, featured short, visible strokes—dots, commas, smears, and blobs. 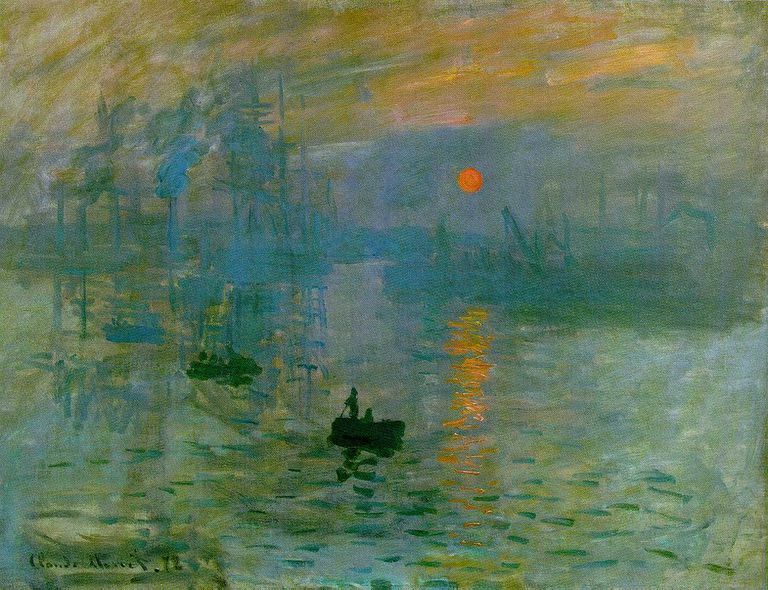 The first piece of art to inspire the critical nickname "impressionism" was Claude Monet's 1873 piece "Impression: Sunrise," a piece that was presented at the first exhibition in 1874. Conservative painter Joseph Vincent was quoted in a review in increasingly sarcastic ways, calling Monet's work "not as finished as wallpaper." To call someone an "Impressionist" in 1874 was an insult, meaning the painter had no skill and lacked the common sense to finish a painting before selling it. In 1874, a group of artists who dedicated themselves to this "messy" style pooled their resources to promote themselves in their own exhibition. The idea was radical. In those days the French art world revolved around the annual Salon, an official exhibition sponsored by the French government through its Académie des Beaux-Arts. 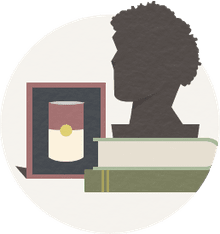 The group (Claude Monet, Edgar Degas, Pierre-Auguste Renoir, Camille Pissarro, and Berthe Morisot, and a raft of others) called themselves the "Anonymous Society of Painters, Sculptors, Engravers, etc." Together they rented exhibition space from the photographer Nadar (a pseudonym of Gaspard-Félix Tournachon). Nadar's studio was in a new building, which was a rather modern edifice; and the entire effect of their efforts caused a sensation. For the average audience, the art looked strange, the exhibition space looked unconventional, and the decision to show their art outside of the Salon or the Academy's orbit (and even sell directly off the walls) seemed close to madness. Indeed, these artists pushed the limits of art in the 1870s far beyond the range of "acceptable" practice. "I confess humbly I do not see nature as they do, never having seen these skies fluffy with pink cotton, these opaque and moiré waters, this multi-colored foliage. Maybe they do exist. I do not know them." Impressionism created a new way of seeing the world. It was a way of observing the city, the suburbs, and the countryside as mirrors of the modernization that each of these artists perceived and wanted to record from their point of view. Modernity, as they knew it, became their subject matter. Mythology, biblical scenes and historical events that had dominated the revered "history" painting of their era were replaced by subjects of contemporary life, such as cafes and street life in Paris, suburban and rural leisure life outside of Paris, dancers and singers and workmen. The Impressionists attempted to capture the quickly shifting light of natural daylight by painting outdoors ("en plein air"). They mixed their colors on the canvas rather than their palettes and painted rapidly in wet-on-wet complementary colors made from new synthetic pigments. To achieve the look they wanted, they invented the technique of "broken colors," leaving gaps in the top layers to reveal colors below, and abandoning the films and glazes of the older masters for a thick impasto of pure, intense color. In a sense, the spectacle of the street, cabaret or seaside resort became "history" painting for these stalwart Independents (who also called themselves the Intransigents—the stubborn ones). The Impressionists mounted eight shows from 1874 to 1886, although very few of the core artists exhibited in every show. After 1886, the gallery dealers organized solo exhibitions or small group shows, and each artist concentrated on his or her own career. Nevertheless, they remained friends (except for Degas, who stopped talking to Pissarro because he was an anti-Dreyfusard and Pissarro was Jewish). They stayed in touch and protected each other well into old age. Among the original group of 1874, Monet survived the longest. He died in 1926. Some artists who exhibited with the Impressionists in the 1870s and 1880s pushed their art into different directions. They became known as Post-Impressionists: Paul Cézanne, Paul Gauguin, and Georges Seurat, among others.